Ya'll know how much I love fish and all things fishy smelling :) and in case you don't I'm being extremely sarcastic... in fact I HATE, DESPISE and am REPULSED by the "fishy" smell. On a Washington, DC mission trip I had to leave the soup kitchen because we were making tuna fish sandwiches, in college I got a job as a hostess at RockFish and had to quit on the day of my training (what was I thinking?!?!)... you get the picture. 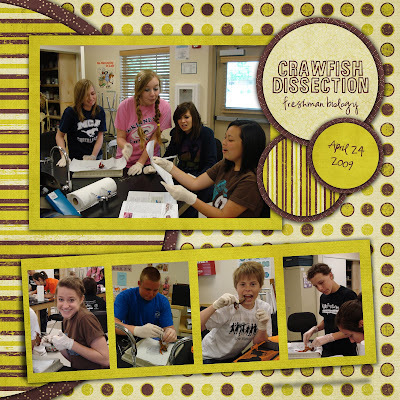 So you can imagine my excitement when I found out that on Friday I'd be subbing for freshman biology and that they would be dissecting crayfish. Thankfully it only smelled like formaldehyde and not fish :) The large picture in the layout below cracks me up... the look on the girl second from the rights face is absolutely priceless. They performed their dissections beautifully and with few mishaps (we did have someone get crayfish "juice" in their eye and one kid removed the eyeballs and tried to flick them on someone else - but it wasn't as dramatic as it sounds - haha).